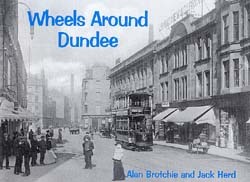 The authors of Wheels Around Dundee have combined a collection of superb transport photographs with some fascinating and nostalgic views of the city (which also happen to feature transport related detail). Trams, trains, carts, buses, hansom cabs, cars, charabancs, steam rollers, tractors and push-bikes jostle for space between the covers, where you'll also find many once-familiar landmarks and scenes of city life dating from before the demolition frenzy of the second half of the twentieth century. The detailed and informative captions will appeal to both transport enthusiasts and those with a more general interest in the city.